Total residential sales were down 14.8% compared to January 2018. There were 142 single family home sales in January 2019, compared to 181 in January 2018-a 21.5% decrease. However, condominium sales were up 14.3% with 48 sales in January 2019 compared to 42 sales in January 2018. The number of new single family home listings rose 13.7%, but the number of new condominium listings dropped 7.7%. 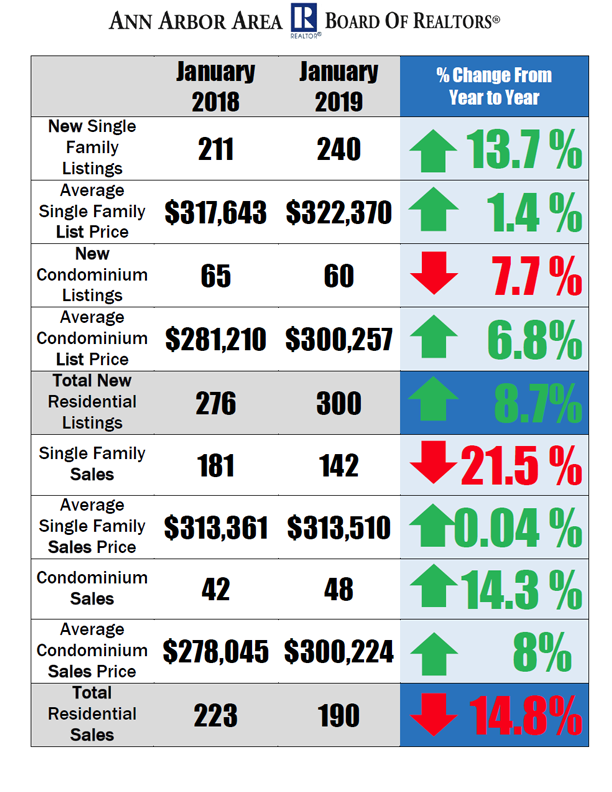 Average listing and prices for both condominiums and single family homes rose in January 2019. The average list price for single family homes was up 1.4%, with an average price of $322,370. The average list price for condominiums was also up 6.8%, with an average list price of $300,257 compared to the average list price of $281,210 a year ago. Sales prices for single family homes rose very slightly-0.04%-to an average sales price of $313,510, and average sales prices for condominiums rose 8%, with an average price of $300,224. Single family homes on the market continue to sell faster than the previous year however, with an average of 47 days on market in January 2019, compared to 51 average days on market in January 2018. To see more Ann Arbor Area housing statistics, view the January 2019 Housing Statistics Report.